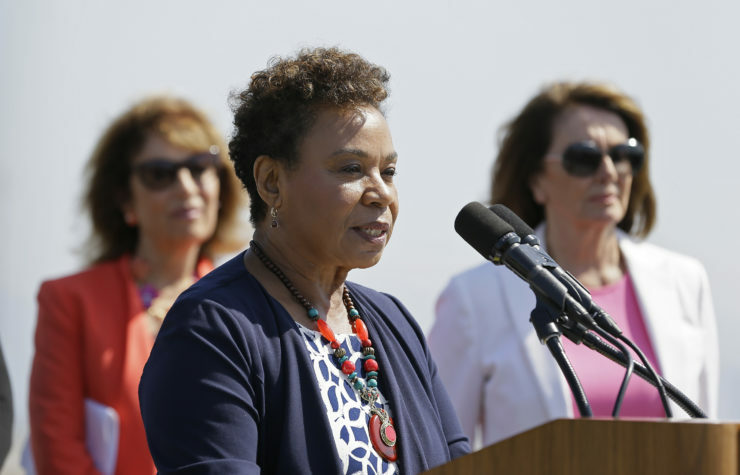 Congresswoman Barbara Lee, center, speaks during an event to commemorate Women's Equality Day earlier this year in San Francisco. Lee is among members of Congress who have called on Silicon Valley tech firms to publicly release their employment data on gender and race, which the companies provide annually to the government. Members of Congress, frustrated with the lack of diversity in the tech industry, are calling on Silicon Valley firms to fully disclose their workplace demographics. An investigation by Reveal from The Center for Investigative Reporting found that of 211 of the top tech companies in the Bay Area, only 23 publicly released their EEO-1 reports, which show the race and gender breakdown of their employees by job category. The government-mandated reports provide hard numbers that reveal how companies compare with each other and change over time. Companies are not legally required to release the forms. Some responded to Reveal by saying they considered the data sensitive or not reflective of their true diversity. Lee’s district includes the Oakland headquarters of Pandora Media, which would not release its EEO-1 report. Pandora didn’t respond to questions but pointed to its diversity web page, which includes pie charts with percentages that are hard to verify and compare, instead of raw numbers. Like so many other tech diversity reports, Pandora’s page doesn’t show the company’s representation of women of color. He also called for companies to release their employee retention data. Underrepresented minorities leaving tech jobs because of unfair treatment is a top concern among diversity advocates. “If tech companies are serious about addressing the lack of diversity in the their industry, they will publish this information at least annually in a place that is visible to the public,” Butterfield’s statement said. Rep. Ro Khanna, D-Calif., whose district sits in the heart of Silicon Valley, also called for companies to disclose the numbers they report to the government. Khanna’s district encompasses the headquarters of companies that do disclose their EEO-1 reports, such as Intel and Apple, and those that do not, such as PayPal. Palo Alto Networks, which fought a shareholder proposal to release its numbers, also is located there. So is Lam Research Corporation, which also opposed a resolution to divulge the company’s EEO-1 stats. That proposal failed at Lam’s annual stockholder meeting Nov. 8, with just over 40 percent in favor. The result of Palo Alto Networks’ vote has not yet been reported to the U.S. Securities and Exchange Commission.